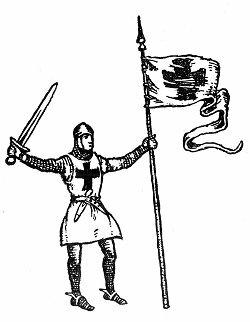 LL the warriors of Brittany had gone away to the Crusades. With helmets and spears, and with banners flying, they had set out for the East. They had gone to rescue the Holy Sepulcher from the infidels and to defend it with their lives. dressed in pink and white blossoms, looked like radiant brides. But the men of Brittany remained in the Holy Land. habits of indolence. 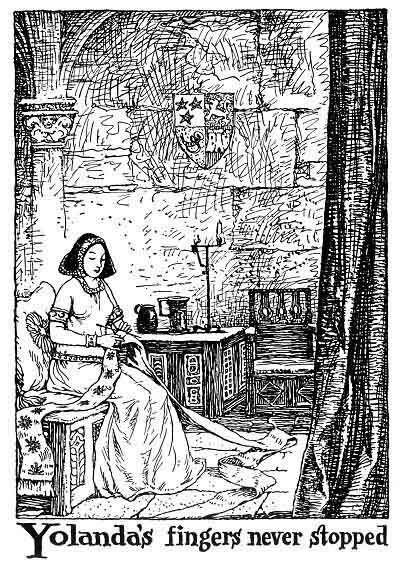 The young ones spent their time on their clothes or admiring themselves in the mirror, when they were not idling on the castle lawns. The older ones gossiped and said unkind things about one another. They all had ceased to think about their men folk fighting in the Holy Land. 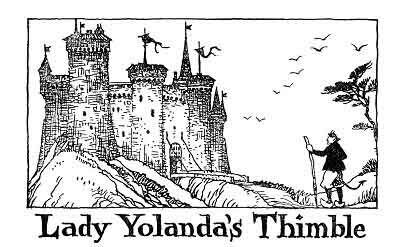 Yolanda de Tregoët lived in a great castle and there she worked with her needle for the church and for the poor. 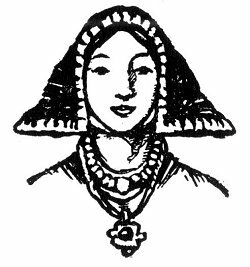 She was betrothed to a famous knight, Jehan de Kergoff. When the warriors had made ready to depart Yolanda had bade Jehan go, and the young knight at her behest had sewed the Cross upon his tunic.